DOYLESTOWN, Pa., May 2, 2017 /PRNewswire/ -- To simplify the medication access process for physicians and patients, the adherence-enhancing Mobile Health Library® (MHL) clinical engagement system now includes the proven time-saving digital prior authorization service of Axon HCS, leading provider of digital, EMR, and integrated practice management solutions to hospitals and group medical practices. With the establishment of MHL/AXON Clinical Workflow Solutions, the Adherent Health services offering now supports 225,000 clinicians practicing in 4,500 hospitals, and across 5,800 total sites of care. "Medication Access" refers to the often time-burdensome process of physicians and staff submitting detailed prior authorization requests to insurance companies for certain medications, diagnostic tests, and procedures. Such submissions are often followed by delays, requests for more information, appeals, and denials. 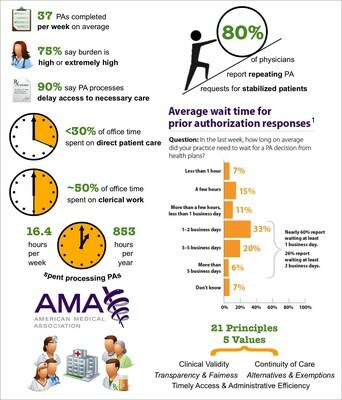 The AMA estimates this prior authorization process consumes 16.4 hours each week for the average physician and staff1 (see infographic). "The MHL/AXON combined service simplifies medication access, even when processed as a medical benefit," says Rob Dhoble, CEO of Adherent Health. "This is very important for physicians prescribing oncology, gastrointestinal, dermatological, autoimmune, multiple sclerosis, rare disease, and specialty medications, and for manufacturers seeking more cost-effective and more measurable alternatives to legacy FAX/HUB/SPP contact center solutions." "In joining the customer value of our respective digital and mobile systems, MHL/AXON becomes the leading health provider services network for medication access, patient education, health outcomes data capture, and medication adherence," stated Melissa Sampson, Chief Development Officer, Axon HCS. "This is a genuine breakthrough in helping patients understand their treatment options and associated actual out of pocket costs, whether processed as a medical or prescription benefit, regardless of insurance carrier." "Everything the patient needs to support their education, affordability, and adherence is all in one easy to access HIPAA-secure place. MHL/AXON options allow patients to better track and report on their health status between office visits." "The MHL/AXON simplicity helps physicians and their staff submit and track their prior authorization requests in real-time, and are often approved while patient is still in the exam room or hospital."